Envato Sites is a streamlined, no-frills solution that’s perfect for cost-conscious users who want to build a professional website without a lot of legwork. Envato Sites is built on the promise of “no unnecessary features.” Registration is free, so anyone can build their entire website and decide if they like it before committing to the reasonable $4 monthly fee. Using Envato, even the most novice web user can build a website that looks about as good as those created by professional web designers. Websites can also be optimized for search engines thanks to the simple “Title Tag,” “Meta Description,” and “Page Keywords” fields. These can be found within the user dashboard. 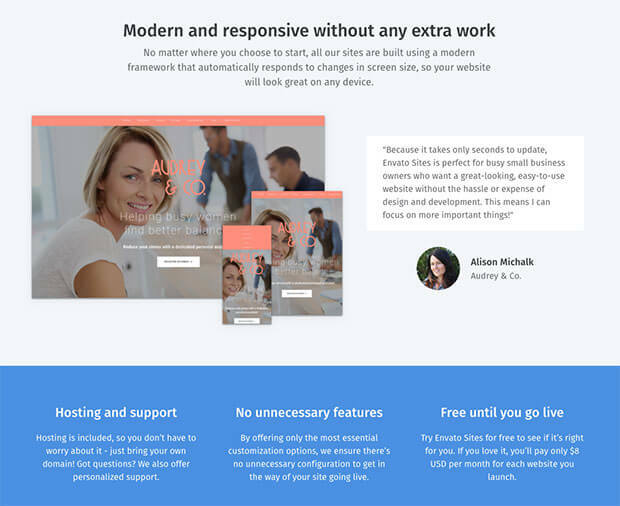 In addition, the responsive templates are categorized by type and industry, so a user can find the right type of layout without having to search the entire library. Envato Sites has one of the simplest pricing structures of any website builder. There’s only one plan, and it’s very affordable at only $8 per month. This plan grants the user unrestricted access to all of the system’s features including hosting, the website builder, and content management system. These features can be accessed on computers as well as mobile devices, so it’s easy to post changes and updates on the go. The platform also makes it easy for a user to promote their social media profiles. As part of the initial setup, Envato provides a series of text fields in which the user can enter their Twitter, Facebook, Instagram, and other social media links. Envato automatically places the social media links in appropriate locations on the page and even allows the user to make their content shareable. Though customer support is only available by email, the support team is extremely friendly and knowledgeable. There are more than 100 professional templates to choose from. Best of all, templates are organized by type and industry, so anyone can find the perfect layout for their fitness site, fashion blog, or online cooking magazine. Full previews are available for every template, and a user can change their layout at any time right from the user dashboard. While many website builders make it impossible to switch to a different template after a site is built, Envato Sites is refreshingly flexible. All templates are built with a responsive design, which means that they automatically conform to all screen sizes. Using Envato Sites, it’s easy to create a website that looks and functions beautifully on desktops, laptops, smartphones, and tablets. Once the template is set, the user just needs to fill in the site with custom text, images, and videos. Usability is what Envato is known for. Just sign up, choose a template, and start editing. The main editor screen consists of an exact preview of the website as it will look to visitors. To edit or customize any text, image, or other element, the user need only click on it and start making changes in the left column. For example, most sites come standard with an “About Us” or “About Me” section. To customize this section, begin by clicking on it. A series of editing options will appear in the left column. These include “Title” (for instance, the words “About Me” can be changed to “Learn More About Me” or anything else the user desires), “Bio” (the actual description text), and “Image.” Just fill in the text boxes with custom information and choose a custom image from a hard drive or from Envato’s stock image library. It’s even possible to change the fonts and colors of text with the click of a button. Envato Sites is still a fairly new player in the website builder game, and only time will tell if it will be a success. For the user who’s tired of navigating a sea of confusing account options and unnecessary features, though, Envato is a godsend. When a template is chosen, the site is practically complete. It’s up to the user to decide if they just want to personalize the text and images or completely overhaul the layout. Envato Sites is not a great choice for those with more advanced needs. The single-page layouts and limited features will prove to be a roadblock for individuals and businesses hoping to build a robust website. In addition, the platform is completely useless for ecommerce stores. Still, for those who just want to establish an online presence and look fantastic while doing it, Envato gets the job done. Founded in 2006 in Melbourne, Australia, Envato is a leading digital enterprise that oversees a number of properties including Envato Market, Envato Studio, Envato Tuts+, Envato Elements, and of course, Envato Sites. The company serves more than 6 million customers and has nearly 300 employees based all across the globe. They have been featured in a number of leading publications including the New York Times, The Next Web, and Graphic Design USA.